Dress in tulle cotton embroidered and lined with volans bouquets of roses and beads. The belt and shoes are of stain. Neapolitan hairdressing by Mr. Urbain Peutier hairdresser to Madame Duchesse de Berry. The idea of a celebrity as a fashion icon is not a new one. This is the second fashion print I own that features the image of the Duchesse de Berry and gives credit to her hairdresser. Apparently the Observateur des Modes thought the duchesse could help influence fashionable ladies. I often wondered what it was about her that made women want to dress like her. I did some research to find out. The Duchesse de Berry began her life as Princess Caroline of Naples and Sicily. She was born Maria Carolina Ferdinanda Luisa on November 5, 1798 to Archduchess Maria Clementina of Austria and Prince Ferdinand, heir to the throne of Naples and Sicily. 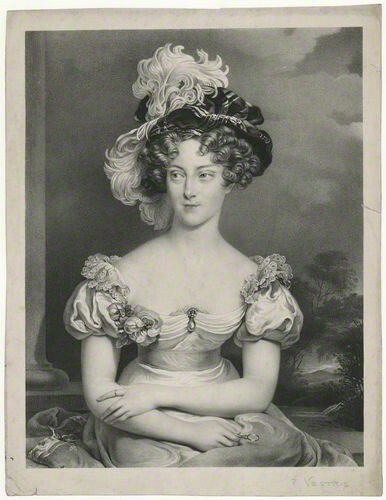 In 1816 she married King Louis XVIII of France’s nephew, Charles Ferdinand d’Artois, and became the Duchesse de Berry otherwise known as Madame de Berry in France. The marriage was reported to be a happy one. 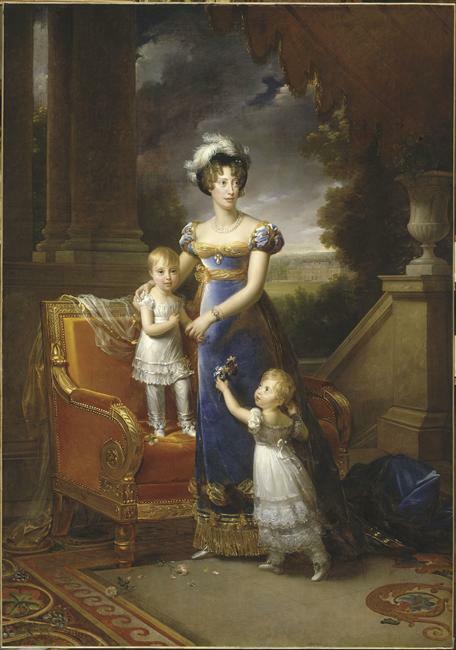 Caroline was quite popular with the French people and was a generous patroness of the arts. She was an enthusiastic art collector and avid theatergoer. 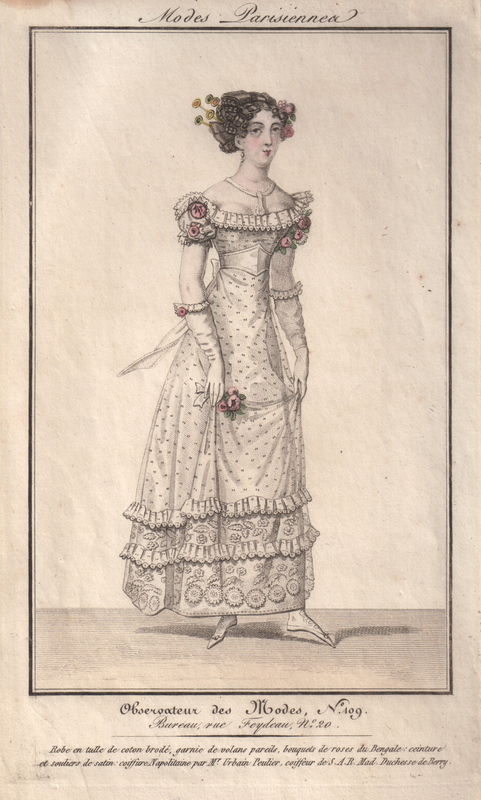 She was a patron of the Théâtre du Gymnase, which changed its name, for a time, to the théâtre de Madame, in her honor. In February of 1820, Berry was murdered before her eyes at the opera. She was 22 years old. In September of that year she gave birth to their second child, a son named Henri, Count of Chambord. Henri was a direct Bourbon line of King Louis XIV of France. Caroline lived at the center of the royal court and became a fashion trendsetter wearing shorter skirts and adopting tailored menswear for riding. Her fame was magnified with the increased popularity of lithography. Printers sold lithographs of her portraits throughout Europe making her a true celebrity of her day. She was an important figure during the Bourbon Restoration. When France’s King Charles X was overthrown in 1830, she fled France and lived for a time in Bath and Edinburgh. In 1832 she tried to regain the throne for her son but was unsuccessful. Somewhere around this time she secretly married an Italian nobleman, Ettore Carlo Lucchesi-Palli, 8th Duke della Grazia. They had five children together. Caroline died in 1870 at the age of 71 in her castle in Austria.